It’s almost All Hallows and you know what that means: snazzy Halloween parties! Even better, Halloween themed book club parties. This one revolves around the ever-classic Dracula, by Bram Stoker, and is an elegant, grown-up kind of Halloween night. Full of frights but never tacky! Keep the decorations to a minimum, opting for mixed metals layered on burgundy tablecloths for Old World elegance straight out of Transylvania. Start with this fabulous gold metal tray from Glitter & Bow and add your own touches from there. This Midnight Mule from The Gouda Life includes root beer, cognac and roasted cherries, a delicious modern sipper for gathering around the fire and swapping scary stories. And how to entertain your fearless guests? One of these great projects and party activities is sure to do the trick. 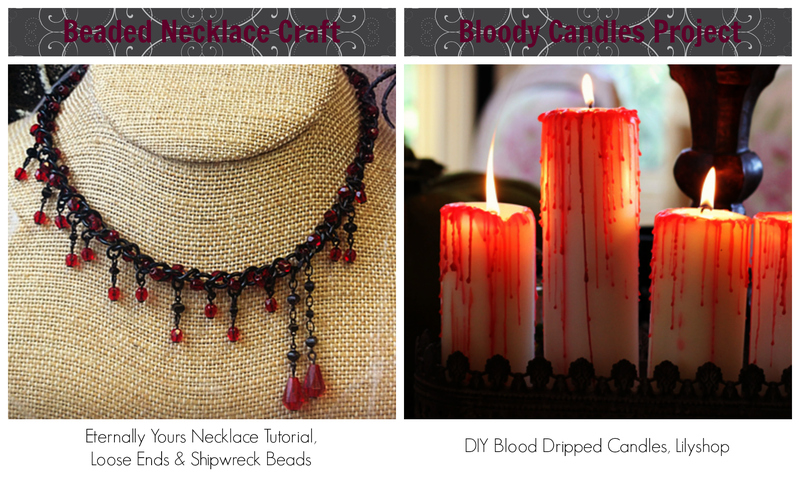 For crafty book clubbers, this beaded necklace tutorial is fun, easy and the perfect addition to any vampire costume! These blood dripping candles are both excellent decor for a vampire party and an easy party activity or favor. Though Dracula is a classic and most people know the basic story, it’s not as widely read as some of the other classics in our Unconventional Book Club. If your club members are not all that familiar with the original text, consider doing some readings of important passages; if your club are already big Dracula fans, maybe read quotes around the room and guess which character said it! For more Unconventional Book Club guides, check out the summer Sherlock Holmes edition!